If you're always looking for ways to up your mac and cheese game, add this recipe to your repertoire. This elegant combination of lobster and macaroni and cheese gets subtle flavor from a splash of sherry and a dash of nutmeg. The dish takes comfort food to a new level! The lobster meat makes the casserole extra-special, and it can be made with even more lobster if you have it. Fresh is best, but if lobster is hard to come by, use frozen lobster tails. Or make the casserole with a combination of other kinds of seafood like shrimp, scallops, or good quality lump crabmeat. Cook the macaroni in boiling salted water following the package directions; drain well. Grease a 2-quart baking dish or spray it with nonstick cooking spray. Melt 3 tablespoons of butter in a saucepan over medium-low heat. Add the parsley and green onions and cook for about 1 minute. Stir in flour until well blended; continue cooking the roux for 2 minutes. Gradually add the milk and continue cooking until thickened, stirring constantly. Whisk the egg in a small bowl or large cup. Whisk in about 1 cup of the hot mixture. Return the egg mixture to the saucepan and blend well. Add 1 cup of sharp Cheddar cheese to the sauce, along with about 1/2 cup of the mild Cheddar or Cheddar Jack and the salt, pepper, and nutmeg. Add the sherry and stir to blend. In a large bowl, combine the sauce with the drained macaroni; fold in the lobster. 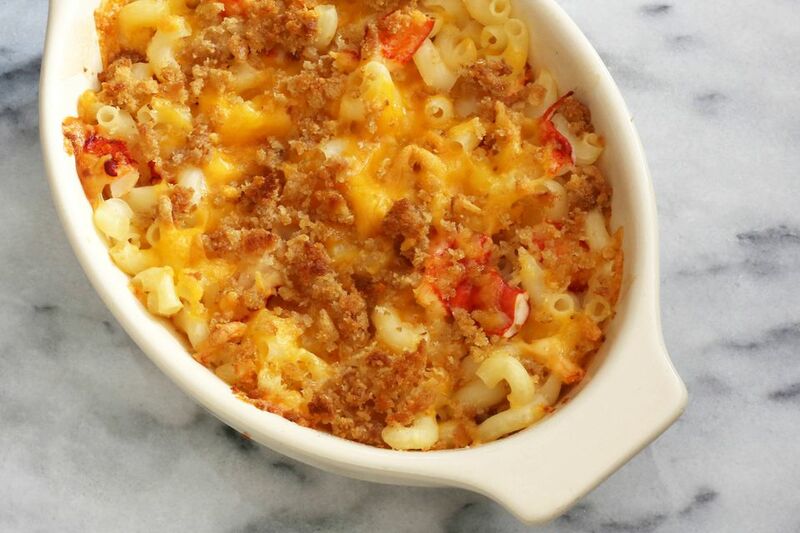 Spoon the lobster and macaroni mixture into the prepared baking dish. Top with the remaining 1/2 cup of shredded cheese. Melt the remaining 3 tablespoons of butter and mix with the breadcrumbs until well blended. Sprinkle the crumbs evenly over the cheese layer. Bake the casserole for 25 minutes, or until the topping has browned and the macaroni and cheese filling is bubbling around the edges. If the topping is pale, put the casserole under the broiler for a minute, or just until the topping has browned. When you have day-old bread, make fresh breadcrumbs! Just tear the bread into pieces and process in a food processor to make fine crumbs. Transfer the breadcrumbs to a freezer bag and seal. Label the bag with the name and date and freeze for up to 3 months. When you need breadcrumbs for casseroles, meatballs or meatloaf, and other dishes, just take some out of the freezer.